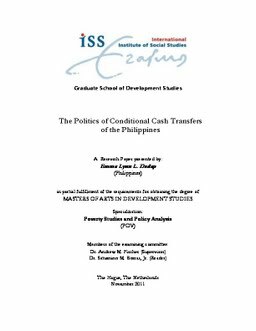 This research examined the conditional cash transfer program of the Philippines, dubbed Pantawid Pamilyang Pilipino Program (Pantawid Pamilya), through a historical institutional approach. It sought to answer the questions, ―Why did the Philippine government decide to embark on a CCT program? How has this decision been influenced by the historical and institutional contexts of social policy of the country, as well as the various forces in the state and in society, and with what implications?‖ The results show that on the surface, the government‘s decision to adopt, continue, and subsequently expand CCTs has been triggered by the urgent need to address poverty in the country, as well as the intent to meet the MDG targets, especially as regards reduction of poverty and hunger, and improvement in education and health indicators. But digging deeper, this decision only reflects the country‘s unchanged social policy trajectory epitomized by the bias for targeted, palliative, and purportedly apolitical social provision measures, not to mention externally-influenced, drawing ―encouragement‖ and financial support from multilateral institutions, all at the expense of structural reform and redistribution. The results further show that the very nature of the scheme which is loath to confront structural issues, paints a bleak picture for the long-term solution of the problems of poverty and inequality, and the necessary shift towards a more redistributive and/or universal social provision. If anything, the Philippine case (re)emphasizes the fact that social policymaking is never a straightforward process, and that there is no hard and fast rule to explain the policy positions of forces in the state and in society at certain junctures. Thesis Advisor Fischer, Andrew M.